As the world becomes increasingly connected, the ability to wirelessly identify and differentiate items gains unprecedented importance. In this scenario, new and exciting applications for the already ubiquitous radio frequency identification (RFID) technology emerge. Recent RFID developments point towards a wealth of untapped potential, particularly when it comes to its combination with novel technologies and software applications. The present article will discuss innovative RFID solutions and the R&D tax credit opportunity they entail. RFID consists in the wireless exchange of information between a tagged object and a reader/writer. Its primary objective is to identify and differentiate items that communicate via radio waves. First used in the 1940s to identify military aircrafts, radio frequency identification has now a myriad of applications. Military and commercial airplanes, car keys, automatic toll pass systems, building access systems, passports, and credit cards are just a few examples. Laptops, tablets, as well as music players and other devices that connect to wireless networks all use RFID as a method of identification. The most common devices that use such method, however, are mobile phones. RFID enables each of them to have its own and unique International Mobile Equipment Identity (IMEI), which identifies a specific phone being used on a mobile network. Put simply, RFID provides unique wireless identification for objects. It serves as a bridge between the physical world and the digital world, as it allows physical objects to be recognized and differentiated by computers. RFID enables the very existence of wireless networks, as it is a way of knowing the difference between two wirelessly connected objects. Passive tags, by far the most common, work by harnessing energy from nearby radio transmitters; in other words, they can only be activated by RFID readers, which are their only source of power. This condition significantly limits the distance at which they operate. This category of tags is designed to be cheap and disposable. Semi-passive tags communicate the same way as passive tags but use internal batteries to power their circuits. Their range of operation is longer than the one of their passive counterparts and the hardware they require is considerably more costly. Finally, active tags use internal batteries to power their circuits and broadcast radio waves to a reader. This allows them to work on a longer range than passive and semi-passive tags. Having their own source of power make such tags larger and more expensive than others. Source: Intermec, ABCs of RFID: Understanding and using radio frequency identification, 2007. RFID tags can also be read-only or read-write. While the former carry unalterable data, the latter can be revised countless times. Different from barcodes, which must be read one at a time and require a direct line of sight with readers, RFID tags offer flexibility of placement and range in relation to readers. RFID is an alternative when other data collecting technologies or manual labor are impractical or impossible. RFID tags can operate despite adverse environments, such as extreme temperatures and exposure to gases and chemicals. In addition, it offers high-speed reading even in indirect lines of sight. RFID tags can hold various sorts of information, such as serial numbers, configuration instructions, and activity history (e.g. maintenance and location reports). Tags can also be connected to sensors in order to capture and record variable information, such as temperature. RFID is an important tool for the optimization of operations, particularly when it comes to industrial automation and supply chain applications. The incorporation of RFID readers in forklifts is an interesting example of how this technology has been used to monitor operations. Since its early days, during the World War II, RFID technology never ceased to evolve in response to the changing needs of people and businesses. There are currently new and exciting RFID applications being developed, which include sophisticated alternatives against counterfeit, innovative sensing systems, and groundbreaking healthcare solutions. The following paragraphs present promising fields for RFID innovation. First used in 1974, barcodes revolutionized the world of commerce. Forty years later, however, RFID labels emerge as a more intelligent alternative for data storage, display, and transmission. The use of RFID technology for item-level tagging has doubled every year since 2008. Also known as "smart labels", they combine human-readable information and barcode technology with RFID. They consist of adhesive labels that are embedded with ultra-thin RFID tag "inlays", offering the read range and unattended processing capabilities of RFID while maintaining the convenience of on-demand label printing. The tag inlay can be encoded with fixed or variable data. Major retailers, such as Walmart, JC Penney, and Macy's have implemented RFID item-level tagging to handle inventory, preventing out of stock situations. Innovative RFID label printers are able to print visible information on the paper side of the label while writing to the memory of the RFID chip inside of it. Headquartered in Lincolnshire, IL, Zebra Technologies Corporation produces a wide range of RFID printers and encoders, from mobile to high-output solutions, designed for various purposes, such as asset tracking, security tagging, and order labeling. The most pressing challenge facing smart labels is price. Innovative efforts are underway to bring down the costs involved, particularly those related to expensive materials. French company with an office in Bentonville, AR, Tageos manufactures ready to use, inlay-free RFID labels. The paper-based labels are considerably less expensive and generate 90% less waste than competing ones. While conventional RFID labels use a process in which chip and antenna are first integrated onto a costly plastic inlay that is later converted into a printable paper label, Tageos assembles both the antenna and the tag silicon directly on a printable paper roll. Some RFID tags have the ability of recording sensor data. The so-called RFID data loggers are devices that periodically take a sensor reading and store the time-stamped sensor data in an on-board memory. At a later time, the data is downloaded to a computer for analysis through an RFID interface. Advantages of RFID-enabled data loggers include the ability of transmitting data and commands to computers without the use of battery power. RFID-enabled, battery-free sensor systems constitute a great data-logging alternative for environments where wireless sensor system technology is not viable, such as metal containers or cans. They allow for sensing in places too small for active sensors and for long-term monitoring in remote locations, where power, receivers, and computer connections may not always be available. Likewise, they enable monitoring over very long distances. Common applications of RFID data loggers include monitoring of environmental conditions, such as temperature, humidity, light levels, pressure, etc. Vibration-sensing tags can be employed on machinery - within a manufacturing facility, for instance. Collected vibration data could indicate a potential problem with a piece of equipment before it actually failed. RFID-enabled vibration sensors have also been used to protect valuable items against theft. Based in Boulder, CO, Phase IV Engineering has pioneered the RFID sensor technology. The company recently launched the groundbreaking MicroT Data Logger. The use of an RFID interface eliminates bulky batteries, making it the world's smallest data logger. Not only does the MicroT have a FDA-approved plastic enclosure, and can therefore be used in food processing, but it is also tolerant to high pressure and high temperatures. Innovative applications of RFID data loggers include patient temperature monitoring and location tracking, two labor-intense tasks that have burdened understaffed hospitals. The Hong Kong Union Hospital, for instance, uses temperature-sensing RFID tags that are applied to patients' abdomens via medical adhesive tape. The sensors measure temperature every 30 seconds and transmit the data to interrogators placed on the walls. The readers then transmit such information to the hospital's network. Another interesting application is the use of RFID-based systems for managing hand-hygiene compliance. Headquartered in Columbia, MD, Technologies Solutions Group designed the Sani-Track system, which consists of a wall unit comprising a motion sensor and an RFID reader, along with readers installed in the celling and badges containing RFID tags. Each badge is encoded with a unique ID number, which can be linked to the wearer's personal information. When a staff member enters a room, the ceiling reader captures his badge's tag ID number and forwards it to the Sani-Track system. The software then expects that same ID to be detected again at the hand-washing dispenser. Despite the controversy it generates, RFID pills can bring major advances in patient monitoring and medication adherence. Digestible microchips embedded in drugs can tell doctors whether patients are taking medications as prescribed. 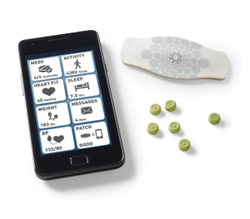 California-based Proteus Digital Health designed an innovative system that includes a sand-particle sized sensor consisting of a minute silicon chip, which contains trace amounts of magnesium and copper. When swallowed and mixed with stomach acids, the chemicals present in the pill generate a slight voltage, which rules out the need of batteries. Through RFID technology it conveys a signal to a reader located in a patch worn over the patient's skin. The reader relays that information to a mobile phone via Bluetooth. A variety of mobile applications allow for the monitoring of drug use and the relay of information to healthcare providers. RFID technology has been widely used to prevent counterfeits. Item-level tagging allows for the authentication of products and is therefore an important tool against forgers. While RFID anti-counterfeit solutions have been largely adopted in specific contexts, such as the pharmaceutical industry, innovative applications can be envisioned. Some experts believe this technology could ultimately be used to prevent money forgery. In an effort to increase security of online connections, Motorola has recently announced its search for alternatives to traditional passwords. 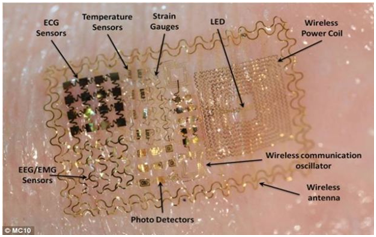 Among the ideas discussed in the last D11 Conference is the use of an RFID flat-chip tattoo. Created by Massachusetts-based firm MC10, the so-called Biostamps are made from silicon and contain flexible electronic circuits. They can be attached to the wearer's skin using a rubber stamp and can be worn for two weeks. This innovative RFID-based authentication system would prevent thieves or strangers from accessing personal devices and accounts in cases of loss or theft. In the words of Motorola's senior vice president for advanced technology and products, Regina Dugan, "after 40 years of advances in computation, we're still authenticating the same way we did years ago - passwords." Wearable RFID technology may be just the tool to change this scenario. Along with other technologies, such as near field communication, RFID has played an important role in the rise of the "Internet of Things" (IoT). The IoT can be defined as "the use of sensors, actuators, and data communication technology built into physical objects that enable those objects to be tracked, coordinated, or controlled across a data network or the Internet". Being able to identify and differentiate objects is key to the IoT and so is the ability to monitor data. An important example of IoT technology is home automation. In this scenario, a smart refrigerator, for instance, could read RFID tags on products and alert users about their expiration. The RFID Journal claims that the IoT will have a significant impact on RFID markets and technology during the next two years. There is no doubt that the number of everyday items embedded with RFID chips and sensors is bound to grow in the foreseeable future. The RFID industry must take this opportunity to invest in novel ways to enhance the competitiveness of RFID solutions. In addition to increasing cost-effectiveness, efforts should focus on the unique advantages of RFID-enabled sensors, such as the possibility of placing them in relatively inaccessible locations and their energy harvesting capacity that eliminates the need for batteries. Often referred to as the driver of a new industrial revolution, 3D printing is yet another emerging technology that can advance innovative RFID applications. 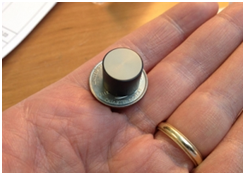 In fact, additive manufacturing allows for RFID tags to be embedded virtually anywhere. As scientists from Carnegie Mellon University recently asserted: "The age of 3D printing, when every object so created can be personalized, will increase the need for tags to keep track of everything." 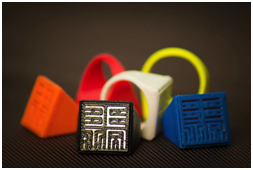 In Boston, two MIT students developed a 3D printed ring that works as an electronic travel card. The crowdfunded "Sesame Ring" lets riders pass through fare gates using only their fingers, therefore avoiding the time-consuming task of digging into purses or inside pockets to find their cards. The innovative rings incorporate RFID chips originally used in conventional travel cards and can be recharged in designated kiosks. 3D printing has been largely applied to prototyping, increasing efficiency in product design and avoiding costly revisions later in the development process. The multiplication of prototypes, however, calls for the use of identification technologies aimed at making them distinguishable from each other. RFID companies are also taking advantage of additive manufacturing to streamline product design. Based in Libertyville, IL, William Frick & Company is a leading producer of custom identification solutions, such as RFID tags. 3D printed prototypes have greatly contributed to improving the company's RFID products, increasing their use, and fostering innovation. There is no doubt that radio frequency identification can bring major efficiency and productivity gains across various fields of activity. Ongoing efforts promise to expand the benefits of this technology to new areas, such as healthcare, security, and data logging. Companies engaged in the development of new and improved RFID applications should take advantage of federal R&D tax credits to support their innovative efforts.